1876 was a stellar year for the United States. From its fledgling beginnings in Philadelphia through several wars and one great divisive internal conflict, the Great Republic was celebrating its Centennial, and rapidly becoming an industrial power like no other on earth. The US had seen its share of bumps along the way. It had taken thirteen years to finally get our Constitution in place, but against the odds, the Republic had survived for 100 years, and was ready to celebrate. That same year, the Winchester Repeating Arms Company of New haven, Connecticut introduced its first repeating rifle that really had enough power to compete with the big Sharps, Remington, Springfield, and other powerful single shot rifles of the day. Introduced to the World at the Philadelphia Exposition celebrating the nation’s one-hundredth birthday, Winchester’s new 1876 Model became known as the Centennial. Up until that time, Winchester really had no rifles with enough power to reliably take the nation’s largest game, such as bear and bison. 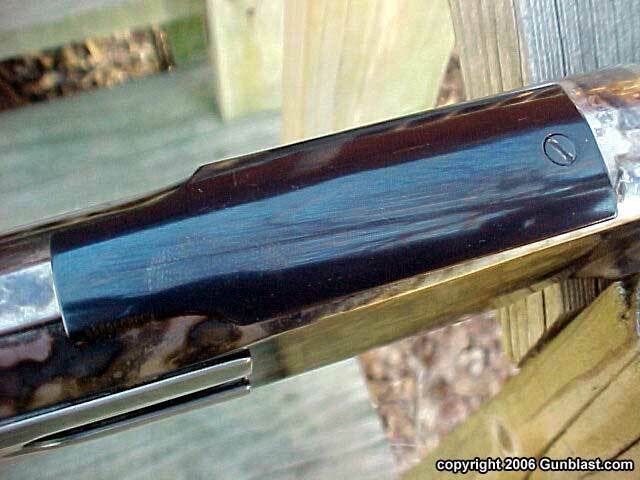 The 1876 changed all that, with its introductory cartridge, the .45-75 WCF. This bottle-necked case gave the Centennial rifle as much power as the government .45-70, but in a rifle that held a dozen of the big cartridges in its magazine. Winchester’s earlier Models 1866 and 1873 were dandy rifles, but lacked the power needed for hunting bison on the Great Plains. 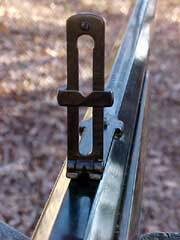 Like the other Winchesters, the Model 1876 used the slick-operating toggle link action, but on a larger receiver. Also like other Winchesters, the 1876 was never adopted by the US military, but the Canadian North West Mounted Police ordered hundreds of the carbine version, where they were in use for many years. 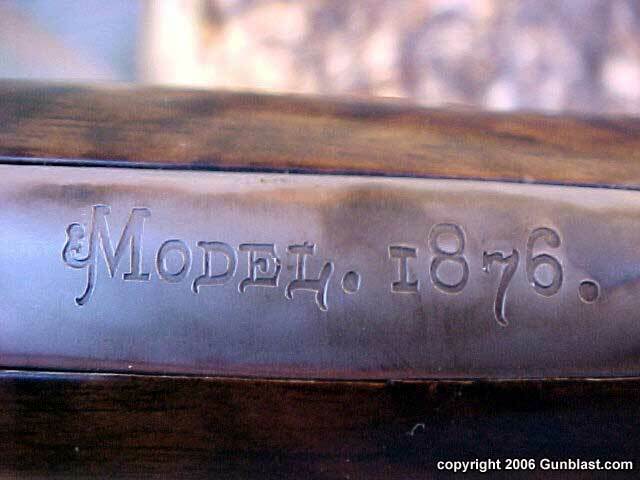 The 1876 was very popular in the northwest parts of North America, and several made their way to .Africa and Asia in the hands of big game hunters. Theodore Roosevelt was a great proponent of the Model 1876, and used them extensively in America and Africa. 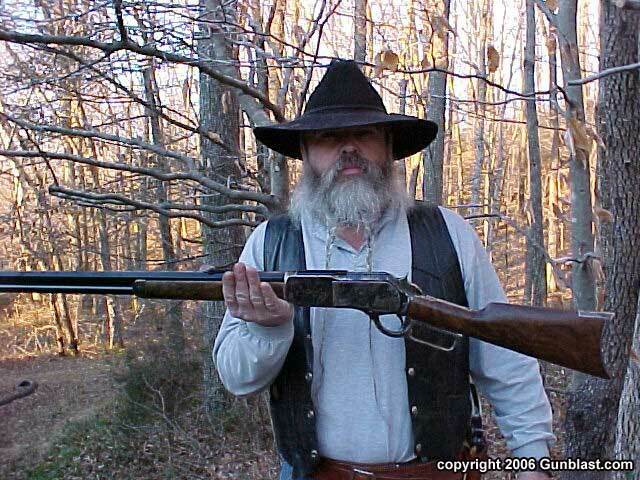 While a lot of shooters today consider the ‘76 to be too heavy, with most rifle versions weighing in at around ten pounds, back then most hunters wanted a powerful repeater that could be carried handily on horseback, as did lawmen, outlaws, Regulators, and others who chose the big Winchester. Original specimens in good condition are somewhat hard to find, as only about 64,000 were ever built. 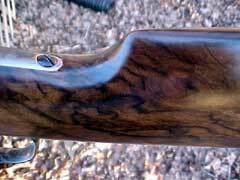 The ones that have survived in good condition exhibit excellent workmanship, as this was Winchester’s top rifle of the day. An original 1876 in workable condition is prohibitively expensive, for me at least. The ones that I have seen for sale cost about as much as a good pickup truck. 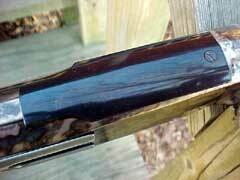 While the replica Winchester market is flooded with affordable examples of the Models 1866, 1873, and even the Henry, the Model 1876 has been mostly ignored, until now. 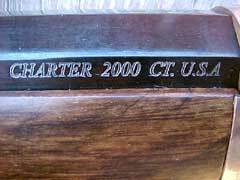 A few months ago, I was speaking with Nick Ecker at Charter 2000, the maker of the Charter revolvers, when he informed me that he was working on importing a replica of the 1876 Winchester. 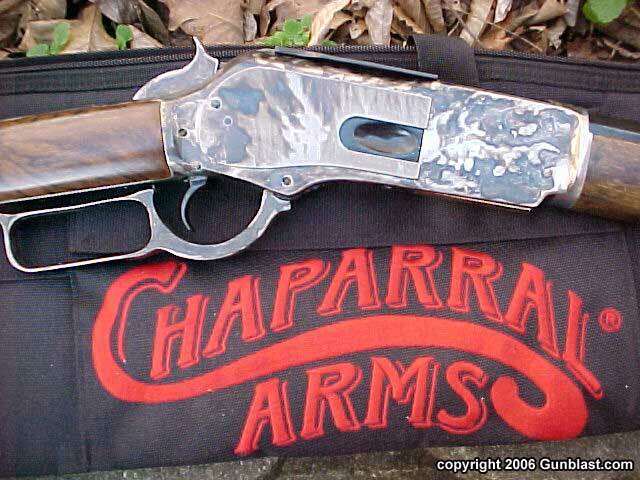 The manufacturer is Chaparral Repeating Arms of Italy. He immediately had my undivided attention. I have always been a fan of that big rifle, and instantly started begging for a test rifle as soon as production guns were ready. Like most things in the gun industry, the wheels of progress turn slowly, especially when import paperwork and such must be endured. 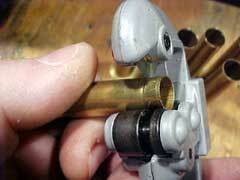 A couple of weeks ago, I learned that the guns were about to be ready, and I started preparing ammunition immediately. 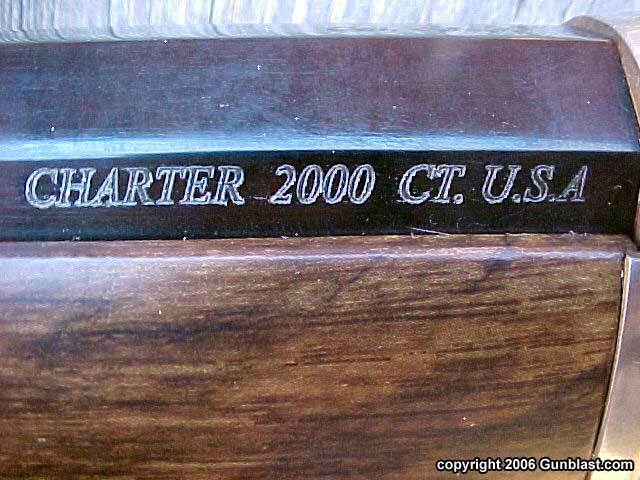 The final assembly of the rifles is done in the United States by Charter 2000, in Connecticut, not far from where the originals were built. 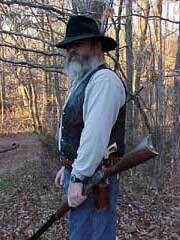 The 1876 is chambered for three of the original rifle’s cartridges: the .45-75, the .45-60, and the .40-60 WCF cartridges. 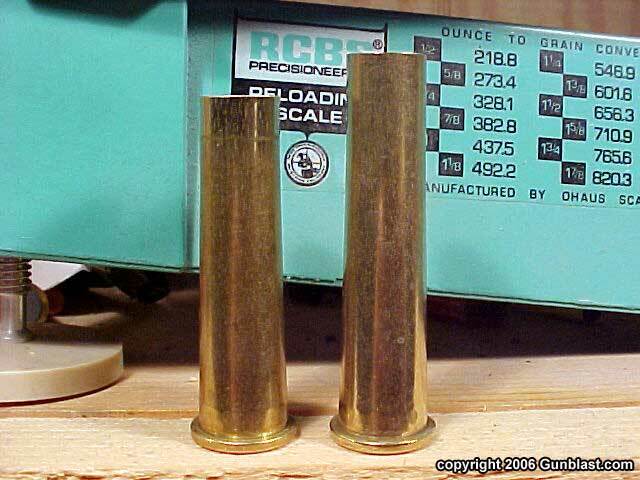 The rifle that I was expecting to arrive was a .45-60, so I had prepared cartridge cases by cutting down .45-70 cases to the proper length, and loaded up a quantity of ammo for the tests using 300 grain cast lead Magnus bullets. The gun that I received is chambered for the .40-60 cartridge, so I had to hastily prepare some ammo for that, as I had neither loaded or ordered any ammo of that type. For those who not load their own, ammo for all three of these chamberings is available from Buffalo Arms (www.buffaloarms.com). 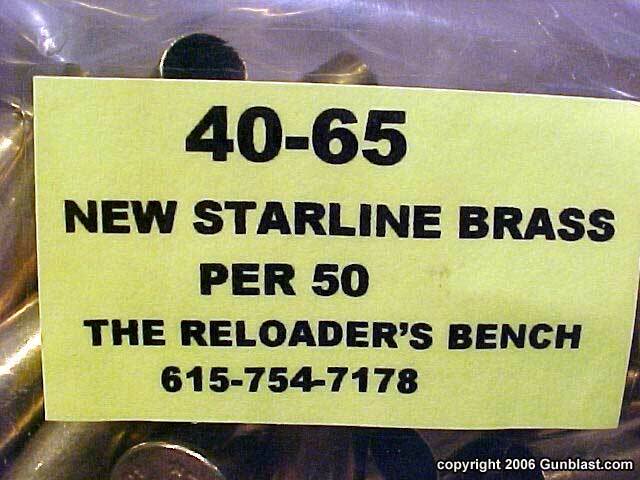 Being caught unprepared, I had to go into my stash of new Starline .40-65 cartridge cases, and I cut them to the proper length for the .40-60 rifle that had arrived. 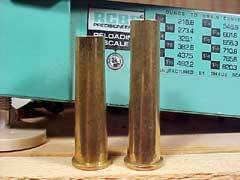 While the .40-60 has a very slight bottleneck shape, the cut down .40-65 cases work just fine. 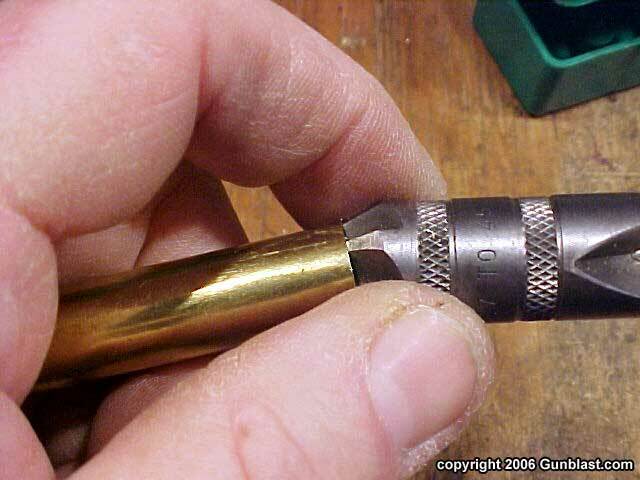 Also being caught without proper .406 diameter lead bullets, I had to use some .410 diameter 210 grain semi-wadcutters, which left the loaded cartridge too large to chamber. 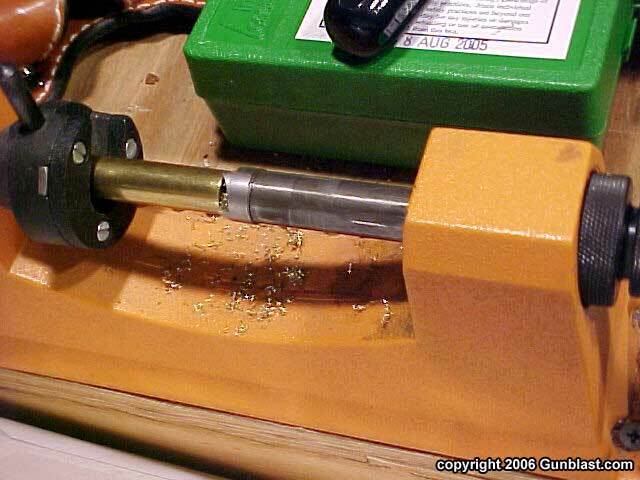 Running the first half inch of the loaded cartridges into a .41 magnum carbide sizer corrected that problem, and the rounds chambered easily in the ‘76 Chaparral. Mt. Baldy sells bullets for the ‘76 of the proper .406 diameter, and Lyman makes a suitable mold for those who like to cast their own, so you will not have to endure the problems that I did. 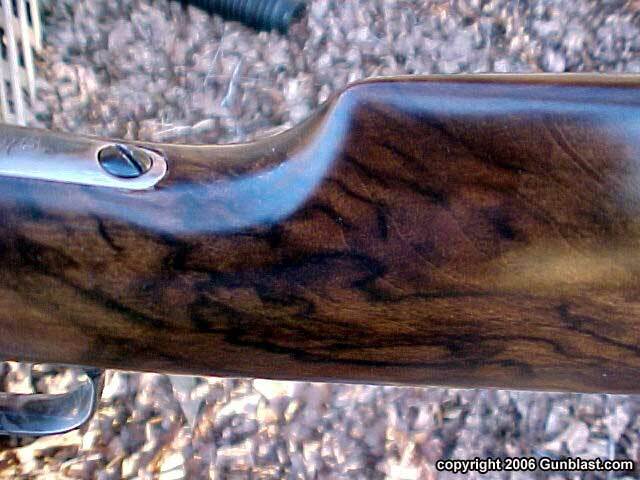 Before getting into the shooting results of this rifle, I suppose a brief description is in order. Upon opening the soft padded gun case in which the Chaparral was shipped, I was stunned when I first saw the thing, and it takes a lot to stun me! Everyone in the hardware store at that time rushed over to see the rifle, and all were gasping at the beauty and elegance of the big rifle. I will state right here, that this is one of the most beautiful rifles that I have ever held in my hands, and I have held plenty. 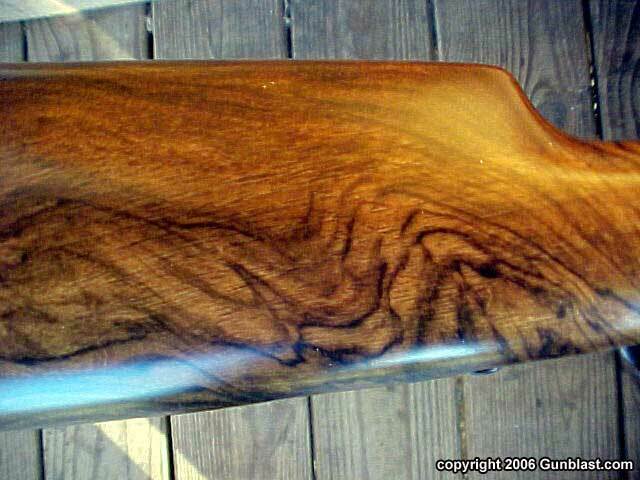 The wood is downright gorgeous. 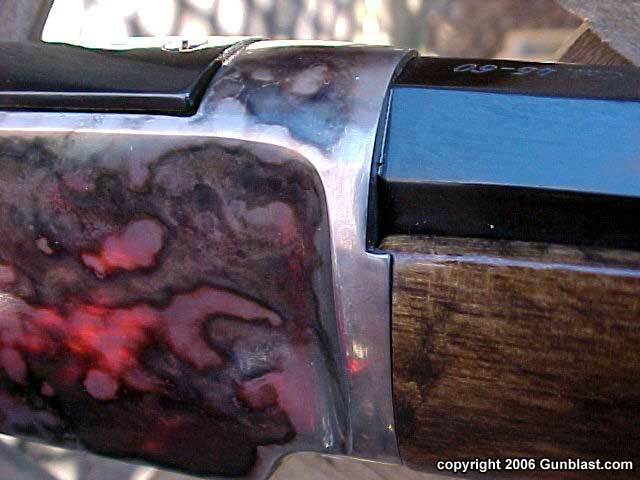 It is a highly figured wood with dark grain throughout the buttstock and forearm. The wood to metal fit is very good. The case colors are vivid and beautifully patterned. The bluing is dark, and nicely polished, and the brass cartridge lifter is highly polished, and furnishes a beautiful contrast to the case colored receiver. The twenty-eight inch tapered octagon barrel wears a long range sporting leaf rear sight, and a brass blade front. 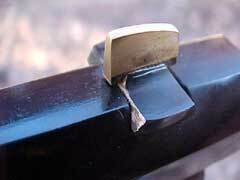 The barrel tapers from one inch at the receiver to eight-tenths of an inch at the muzzle. 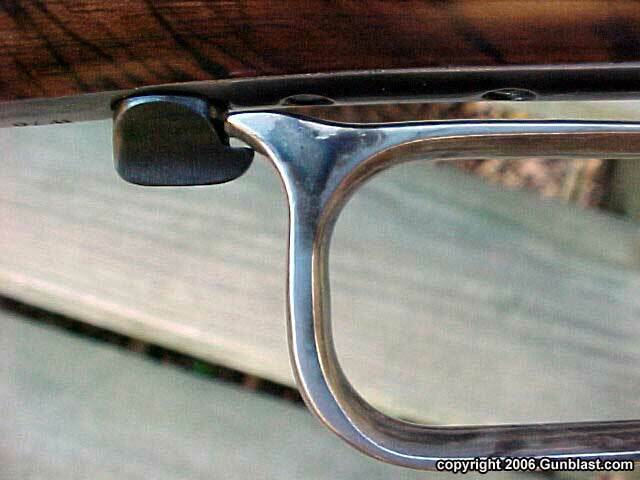 The straight buttstock wears a rifle-type case colored steel buttplate that has a sliding brass cover to contain a sectioned cleaning rod within the stock. 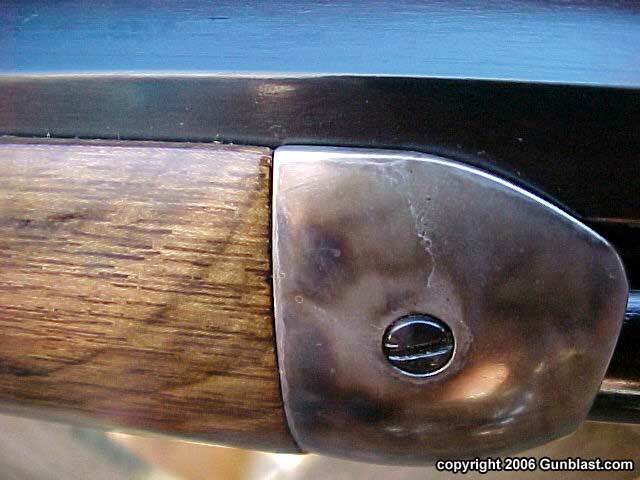 The Chaparral is of the third variation of the 1876 style, meaning that the guide for the dust cover is made integral with the receiver, instead of screwed on as with the second variation guns. 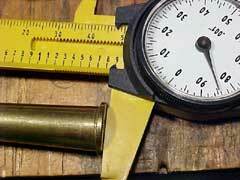 The full-length magazine on the test rifle holds twelve of the .40-60 cartridges. I am very impressed with the fit and finish of the rifle. I was so impressed with the quality and grade of the wood that I called Nick to inquire about it. I thought that maybe he had picked it out special for me. 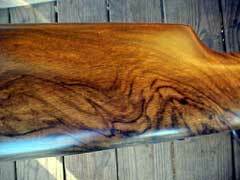 He said that every rifle in that first shipment had gorgeous wood. Hopefully, that trend will continue. 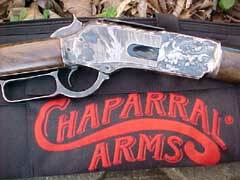 The Chaparral .40-60 rifle weighs in at just over ten pounds. Mine weighed 10 pounds, 2.8 ounces, to be exact. The trigger pull measured a bit heavier than I like, releasing with just over six pounds of pressure. The action on the ‘76 works extremely smoothly, especially for someone who is used to working the lever on more modern lever action designs. There is nothing quite as smooth as a well-fitted toggle link, and the Chaparral is fitted well. 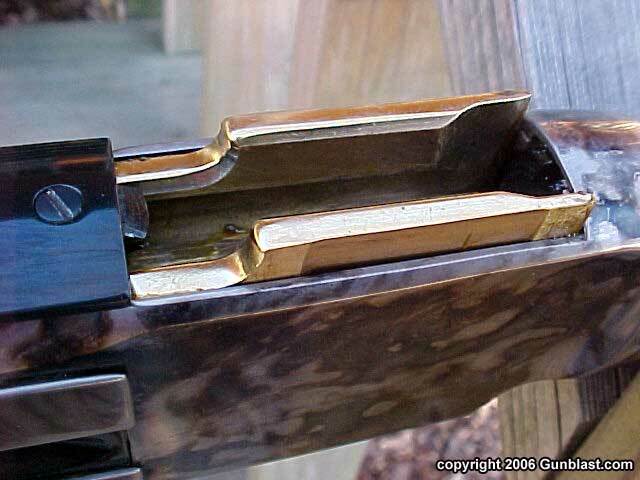 The gun exhibits excellent craftsmanship. Shooting the .40-60 Chaparral proved to be a real pleasure. 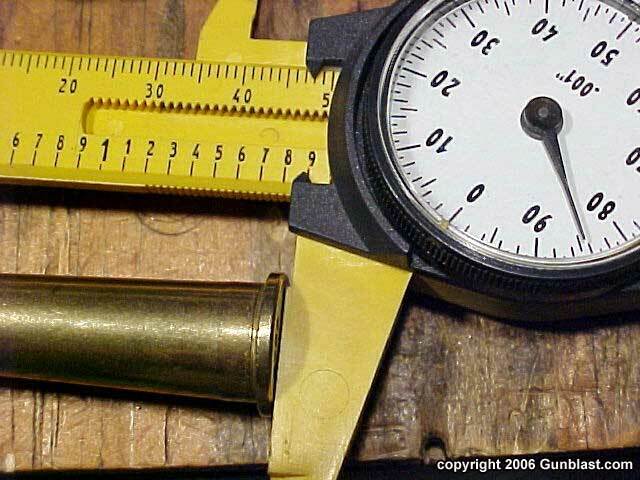 The loads that I assembled fired the 210 grain bullet at an average of 1393 feet-per-second, and had an average deviation of only 2.1, which is extremely consistent. I loaded twenty-three grains of Hodgdon 4227 powder with a Federal GM210 primer. Recoil was very mild. Accuracy was good using the open sights. As it was cold and the wind was howling, I was only able to shoot the rifle at first at a range of thirty yards, where it was easy to keep the bullets on target in a tight one-inch circle. 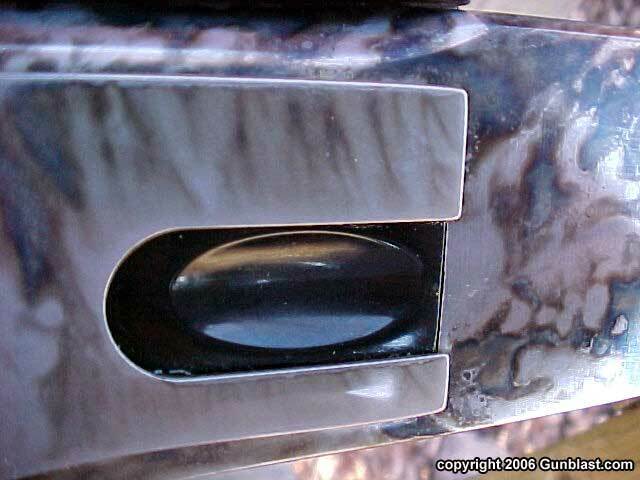 The following day had better weather conditions, and shooting the Chaparral at 100 yards proved the accuracy to be about as good as I can shoot open V-notch sights at that range, displaying groups in the three to three and one-half inch range. I am certain that the rifle could do better with a better shooter, but I was well-satisfied with the groups shown. I also would love to try the rifle with a properly sized bullet, such as the one offered by Mt. Baldy, and I might get to do so later, but my deadline for this piece did not allow it for now. After my first conversation with Nick about the new 1876 Chaparral, I was anxious to see how the actual production guns would turn out, as to fit, finish, accuracy, and function, as many replica rifles are rather plain. All of my expectations were greatly exceeded. I had anticipated a rather unadorned, but functional rifle. The final product is much more than that. 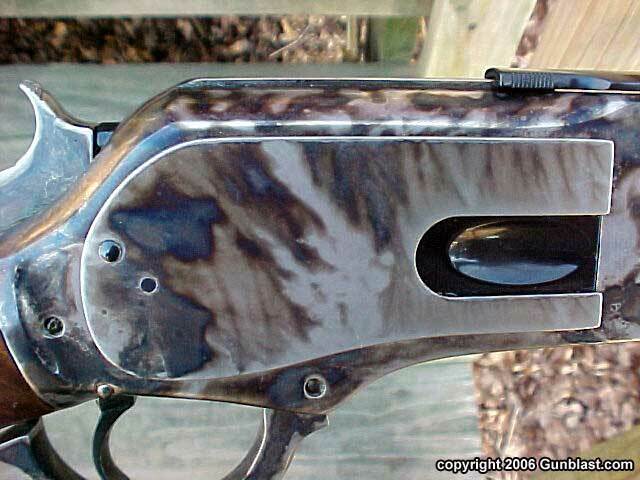 It is an absolutely beautiful, well-fitted, and accurate rifle. 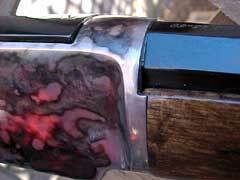 I still want to get my hands on one of these chambered for the .45-60. If it is the quality of this first sample gun, I will not be disappointed. MKS Supply is handling the distribution of these fine rifles, and as soon as they have the information on their website, we will add a link here. Several distributors are already committed to carrying the Chaparral, AccuSport being one of them. For a high-quality, beautiful, functional rifle that just reeks of history, you can’t go wrong with one of these Chaparral 1876 leverguns. 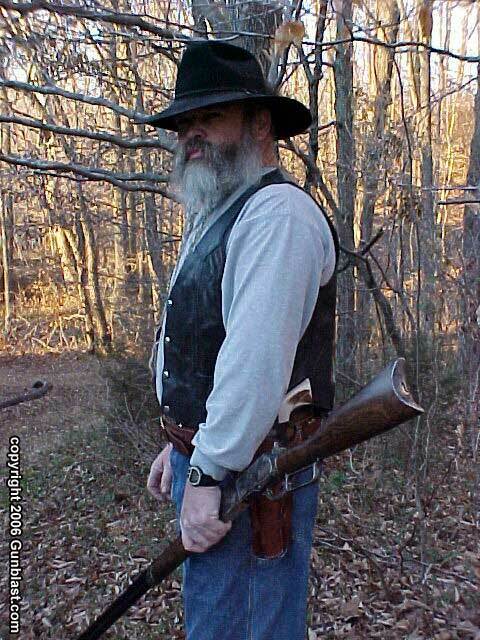 I know that I am buying one, and I can’t recommend a gun any higher than that. UPDATE: Since writing this article, I have learned that the figure in the wood is enhanced, or applied, to the surface of a plainer grade of wood. 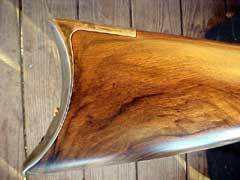 It is still beautiful wood, as the pictures show, but the surface grain finish does not run throughout the wood; rather it is a part of the finishing process. 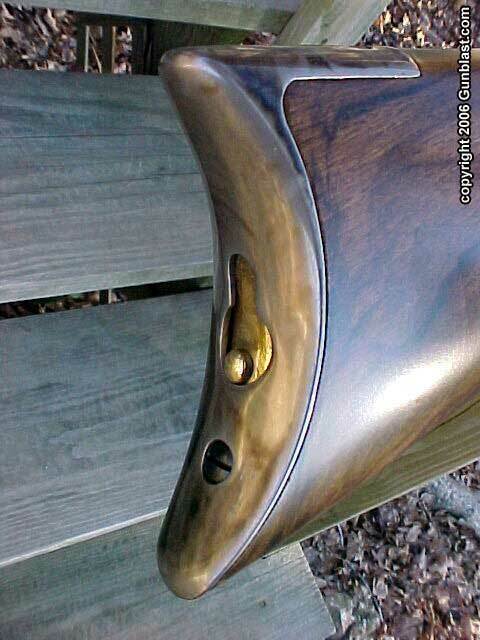 I was fooled until I removed the buttstock to get to the hammer spring. The wood still looks as good as ever, but I wanted our readers to know that if the surface is sanded or reshaped for any reason, the grain does not run through to the interior of the wood, but is only on the surface. 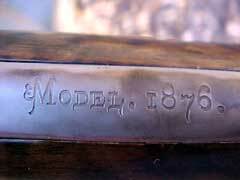 Chaparral Arms Model 1876 Winchester Replica Levergun. 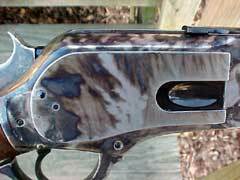 Author's cautiously-high expectations were exceeded by this beautiful rifle. 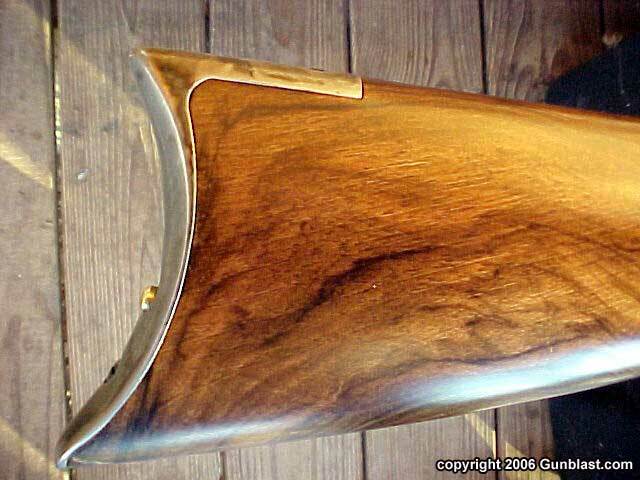 The high-grade wood stock is absolutely gorgeous. Pictures do not do it justice. Metal work is superb, with beautifully vivid antique-looking case colors and highly-polished blue and brass. 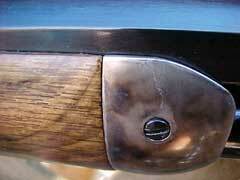 Wood to metal fit is excellent, and indicative of a high level of craftsmanship. Markings, while obviously not in identical to the original Winchesters, have a nineteenth-century look. Sights are traditional: dovetailed brass blade front and "ladder" style rear. 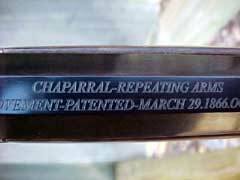 While not a lightweight rifle by any means, the Chaparral 1876 balances perfectly, just as the originals. 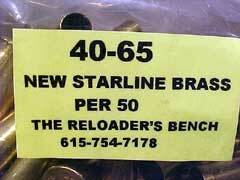 Jeff formed .40-60 cases from new Starline .40-65 brass.